Reviews mean so much to authors. 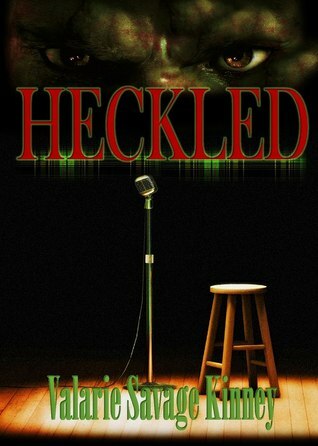 This one in particular is a great review of my book Heckled. If you’ve read any of my books, please consider leaving a review. I’d love to know what you think! Exxel Jensen has spent his entire life finding ways to cope with his mental illness. Although his family and friends know he’s depressed, they really don’t know the true extent of it. Exxel lives with another person in his world, a person no one else can see or hear—the Heckler. Drinking, drugs, and cutting help Exxel banish the Heckler, but only temporarily. Exxel has a loving and supportive wife who would do anything to help him, and he also has a baby on the way. He should be happy, but happiness is the one thing Exxel can’t feel. Seven years ago on this date, my youngest son Bean was up early, telling me he had jokes planned for his friends at school, laughing already because he knew it was going to be so much fun. I took the other three kids in to school (Bean was in afternoon kindergarten) and while I was gone, my mom called and told my husband my dad had collapsed while brushing his teeth in the bathroom and had fallen against the door, preventing her from being able to get in. She called 911 and then us. We hurried little Bean into the car and took off. All the way there I kept thinking but he’s not sick and maybe he needs CPR, I can do that and Mom must be so scared but never in my mind did I think he was dead. He was, though. When we arrived at the house, the ambulance was there and I ran in the door to see my dad on the floor in the hallway and my mom was screaming, “He’s not breathing! He’s not breathing!” I stumbled back out the door, fell on the cold garage floor and cried for my daddy. My brother and sister came just then, my sister with a half drunk bottle of orange pop in her hand, and she promptly bent over the grass of the front yard and threw up. The EMTs loaded my dad on a stretcher and put him in the back of the ambulance. I could see the vehicle bouncing up and down in time to the CPR compressions, could count out the amount of time while they stopped to give breaths and the ambulance held still. Then compressions would begin again and the ambulance would bounce along. As we drove to the hospital, I felt hysterical inside but outwardly I kept whispering It’s okay, It’s okay and I wished with all I had within me that I had signed Bean up for morning kindergarten, if I could have gone back in time I would have done just that, because he was far too little to have to be in the speeding car with frantic me, far too little to have to lose his only Papa. Far too little to have to witness our raw grief. When the doctor came and told us that despite their best efforts, my dad was gone, my bones shook within me like they were going to explode and I felt so lost, so inadequate for the task set before me. I had to start calling people. My voice shook and seemed to echo in that terrible, stark room they had us in at the hospital. I hated that room so much. And the tissues provided were terrible, thin and scratchy and did not help much at all to sop up my tears. I ran through the list of contacts in my mom’s cell phone and called my aunts first, then on down the list of people who needed to know. One of those people asked me, as I spoke through muffled sobs, if this was an April Fool’s joke. Was I trying to be funny? I’m not sure anyone would use death as a way to be funny, but no, I said, this is real. Oh God, was it ever real. It’s been seven years, now. Seven years without my dad. I still kind of hate April Fool’s day.